Neshyia and Sarah stop for a picture with their running buddy, Gale Bevington. 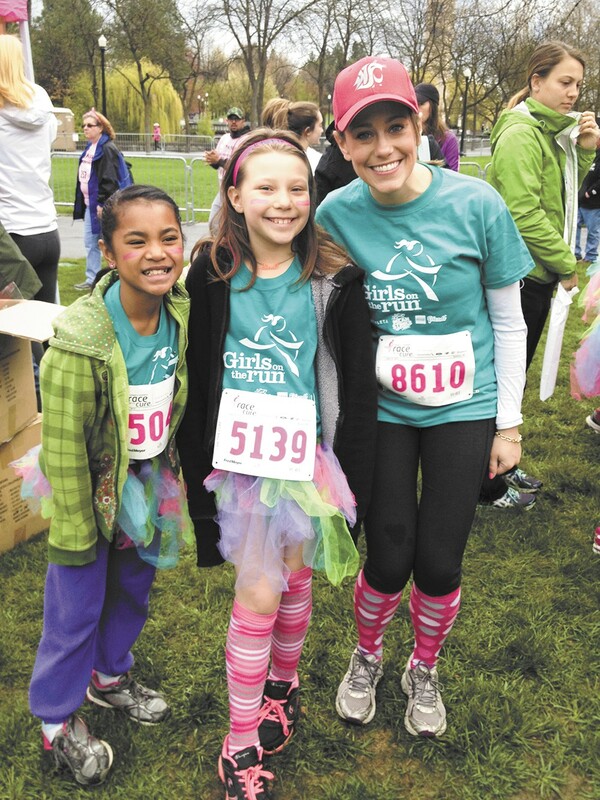 A group of girls in bright tutus, matching T-shirts and hair ribbons dashed across the finish line together. "They were all glammed-up and excited, and when they crossed the finish line, it was like a big party," says Kristi Morris. The girls had just finished their culminating 5K run in April at the end of their first season of Girls on the Run, an organization with more than 200 councils nationwide that teaches girls in third through eighth grades personal values while incorporating running. Several local women formed a board last year in order to create a GIRLS ON THE RUN (gotrspokane.org) chapter for Spokane. They gathered volunteer coaches and adult running buddies for the girls and started the first programs in the spring at Mullan Road and Grant elementary schools. "The mission is basically to help young girls with self-confidence, with the regular issues girls deal with," says Morris, the board's secretary. Each program lasts 10 to 12 weeks, with sessions twice weekly that always include a warmup, lesson and workout, usually running games. Through the sessions, the curriculum teaches the girls things like how to use positive self-talk to counter negativity, and how to view emotions as healthy. The end of every season concludes with the girls running a 5K. The idea isn't to promote competitive running, Morris says, but rather to use running as a tool to help them realize their potential.